The Temple as the Maternal Place of the Church | Cardinal Christoph Schonborn O.P. Then Jesus said to his disciples, "Whoever wishes to come after me must deny himself, take up his cross, and follow me. For whoever wishes to save his life will lose it, but whoever loses his life for my sake will find it. What profit would there be for one to gain the whole world and forfeit his life? Or what can one give in exchange for his life? For the Son of Man will come with his angels in his Father's glory, and then he will repay everyone according to his conduct. Amen, I say to you, there are some standing here who will not taste death until they see the Son of Man coming in his kingdom" (Matt. 16:24-28). The first reading is taken from the Book of the Prophet Jeremiah 20:7-9 in which we hear Jeremiah giving voice to this internal anguish of mind; he hates what he has to say to his people, yet he is compelled by God to say it. The second reading is from the Letter of St. Paul to the Romans 12:1-2 in which he tells the Roman Christians (converts, for the most part, from paganism) that they must prove themselves worthy of this great favor, they must live truly Christian lives. The Gospel is from Matt. 16:21-27. From all eternity this was God's plan for mankind. But because sin had entered into the world before the Incarnation took place, the Son of God in his human nature had to suffer the violent death of the cross at the hands of sinners. In this very suffering he became the Lamb of God who took away the sins of the world, as the second-Isaiah had foretold in his "suffering servant" prophecies (Is. 53: 1-7; 42: 1-9 etc). His death, because he was God as well as man, was a sacrifice, an atonement, of infinite value, and therefore obtained forgiveness from the Father for all the sins of the human race. In foretelling his sufferings and death, which took place some months later, Christ intended to prepare his disciples and other followers for what he knew would be for them a severe crisis of faith. He also took occasion from it to remind his disciples, and all others who would follow him, of what their attitude to suffering and death should be. He told them, and us too, that we must be ever ready to accept sufferings in this life, and even an untimely death if that should be demanded of us, rather than deny our Christian faith. To prove their loyalty to their faith in Christ thousands of Christians in the early Church, and thousands more during persecutions in later centuries, gladly took him at his word and went joyfully to their martyrdom. It is to be hoped that, aided by God's grace, we would all be ready to imitate their example, if called on to prove our fidelity to Christ and our Christian faith. But at the moment what Christ expects and asks of us is that we should bear the sufferings and hardships of daily life cheerfully and gladly for his sake. This daily carrying of our Christian cross can be, and is for many, a prolonged martyrdom. Poverty, ill-health, cruelty and hardheartedness met with in the home and in one's neighbors, are heavy crosses which only a truly Christian shoulder can bear. But, if we were offered health, happiness, peace, wealth and power for the next fifty or seventy years on this earth, in exchange for an eternal heaven after death, what rational one among us would accept that offer? Christians know that this life is a period of training, which makes us ready hereafter to receive the eternal reward which Christ has won for us. Every trainee knows that one must endure certain hardships and sufferings in order to merit graduation into one's chosen profession or trade. On our Christian graduation day we shall, please God, hear the welcome words : "Well done good and faithful servant; because you have been faithful in small things, I will trust you with greater, come and join in your Master's happiness" (Mt. 25: 21). May God grant that every one of us will hear these words of welcome. "A Samaritan (seeing the robbers' victim) was moved with compassion, bound up his wounds, pouring on oil and wine, and took care of him. 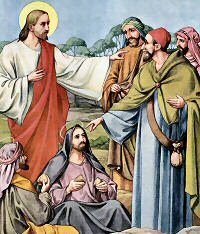 And Jesus said, 'Go and do thou also in like manner'" (Gospel). St. Bede suggests that this victim is Adam and the human race robbed by Satan (pictured at left). Jesus, our Divine Rescuer (pictured at right), comes to pour "wine and oil" into our "wounds": the "life"-giving Wine of His Precious Blood (PostCommunion), the "cheerful...oil" of all His Sacraments (Communion Verse). What Christ does for us, we "in like manner" are to do unto others, friend and foe. "Samaritan-charity" is Christ's own teaching.